It was July 2013, and the plan was to spend a week in Charlottesville, Virginia, where we would do some walking on the nearby Appalachian Trail. We also reckoned on a bit of local sightseeing, including Monticello, the home of Thomas Jefferson, 3rd President of the United States and celebrated as chief author of the Declaration of Independence. After that we would head further south, in search of music. As it happened, we switched our priorities a bit in Charlottesville, as we discovered that midsummer is not the ideal time for walking in Virginia. It’s not just the heat or humidity, which can be oppressive. The vegetation grows to such an extent, with all the trees in leaf, that the trails become very enclosed, with only restricted views of the wider landscape. Conversely, we discovered that Jefferson’s wasn’t the only presidential home in the vicinity. Also nearby were the homes of James Madison and James Monroe, respectively Montpelier and Ash Lawn. Jefferson, Madison and Monroe were all ‘Founding Fathers’ of the United States, and the third, fourth and fifth Presidents. I knew a bit about Jefferson already, but not nearly as much as I thought. Touring their residences and hearing their stories was a thought-provoking start to our trip, introducing us to the complex attitudes and contradictions that formed the basis of American politics – and the issue of race. Not to prolong this prologue unduly, but these were intelligent, ‘Enlightenment Men’, rallying to a truth they proclaimed 'to be self-evident, that all men are created equal’. But they were also elitists, who aimed to create a Union that would 'secure the blessings of liberty', but essentially envisaged a government led by educated people like them.They were also capable of believing that slavery was wrong, but that circumstances were such that nothing could be done about it. Jefferson owned a couple of hundred slaves himself, in spite of his apparent disapproval of the practice, and freed only a few of them on his death. Monroe, meanwhile, believed slavery had to end, but that it would not be feasible for slaves to remain in the States; so he came up with the concept of founding a homeland for them in Africa – hence Liberia (ie, land of liberty), the capital of which is Monrovia, named after him. Charlottesville is a small university town – Jefferson founded the University of Virginia there, and it gave us a pleasant week of good food, rest and relaxation, in addition to the walking and presidential stuff. While music wasn’t the priority here, it wasn’t entirely absent either. One afternoon we took shelter from a downpour in the Number 3 Sports Bar, in an area called ‘The Corner’ across the road from UVa, and were assailed by the likes of Zeppelin, The Guess Who, The Doors and Jethro Tull. Meanwhile someone had tuned the radio in our hire car to supply a diet of classic rock. We caught a couple of acts playing in local bars too, and even one young lad putting on a show in a garage, facing a local park. The music was about to take centre stage though, when we set off for Nashville. There's a version of this Bobby "Blue" Bland cover on Jo's recently released live recording from the Albert Hall at last year's Bluesfest. But here's a rather nifty rendition of 'Ain't No Love' in the rather more intimate surroundings of Saltburn Blues Club. I grew up with the Whitesnake version of this song, which was excellent - albeit somewhat spoilt in live recordings by the crowd repeatedly getting the words wrong. Sounds awfully like Vic Reeves doing the introduction, by the way! Here's an album that's a blast of fresh air and Spring sunshine. 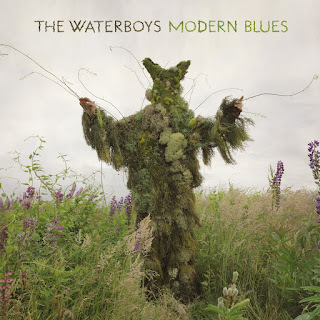 Mike Scott and his gang continue to be idiosyncratic in some ways, but Modern Blues has a punchier, more mainstream sound than much of their earlier output. Opener 'Destinies Entwined' sets the tone by kicking off with a throbbing riff and a swirl of keyboards, and some Dylanesque wordsmithery from Scott. It may be a bit lightweight, but it's still an effective warm-up for what follows. It's with the third track, 'Still A Freak', that this set really hits its stride, swaggering in with another gritty guitar riff and Booker T-ish keys, this time allied to more terse, determined lyrics, and elevated by a blistering guitar solo from Jay Barclay, full of tension and release. The following 'I Can See Elvis' swings more loosely, playing with the image of Elvis as King in the afterlife, hanging out with dead icons of rock'n'roll and beyond. It's a humorous conceit, with a delightful pay off line that I won't give away. There's often a beat aesthetic at play in both the words and music, the ultimate giveaway being the reading by Jack Kerouac that opens the final track, 'Long Strange Golden Road', while echoes of Van the Man drift to the fore here and there through a piano line or a horn phrase - 'Nearest Thing to Hip' practically quotes the horn figure from 'Did Ye Get Healed?'. Lyrically, Scott carries this off with ease. He conjures up dreamy epiphanies, neighbourhood nostalgia with a curled lip, reported conversations, and even an acid assessment of a lost love's husband. Meantime the music is a bubbling, soulful brew that strides along with purpose, aided by a characteristically vibrant mix by Bob Clearmountain. Modern Blues may not be a classic, but it's good enough to demonstrate that The Waterboys are very much alive and kicking. For people who like this sort of thing, this is the sort of thing they'll like. Duke Garwood is a Londoner, apparently a multi-instrumentalist, and an occasional collaborator of Mark Lanegan. This last is an indicator of the kind of dark Americana that Heavy Love inhabits. The arrangements are pared to the bone, the lyrics bleak and oblique. It's atmospheric, claustrophobic, possibly even cinematic. I picture a character driving in the dark in some kind of American wilderness, or chain-smoking in an unlit back yard on a humid evening, with the sounds of crickets in the background as he stares into the dark. It's redolent of a scene in John Updike's novel Rabbit, Run, in which Rabbit Angstrom drives aimlessly in the woods around his home town, getting nowhere. And that, essentially, is it. It's a mood piece, virtually devoid of dynamics. It's sombre, sub fusc, occasionally droning stuff, very much through a glass darkly. Consonant with the stark and spare instrumentation, Garwood adopts a muttering, keening singing style. Occasionally a guitar is allowed to twinkle a little, as on 'Burning Seas', creating some sharp points of light in the ongoing dusk. But such contrasts are limited. I'm forcibly reminded of Raising Sand, and for me that is not a recommendation. Grammy Awards notwithstanding, RS is a classic example of the Emperor's new clothes. It's a style I think of as Gloom Blues, which before long leaves me exclaiming "Cheer up, for god's sake!" Somewhere along the way Garwood conjures a brief moment that echoes 'The Beast In Me', which Nick Lowe wrote for Johnny Cash - and that lays things bare. There are good examples of this genre, such as Springsteen's Nebraska and Cash's American Recordings. But they work because the songs have heart - strong melodies and lyrics that tell stories. Give me the Man in Black's cracked vocals and simple guitar anyday. Don't know where the guy recorded this, but it's a good live recording of Sam Fish doing a neat minimalist version of 'In My Time Of Dying', featuring classy slide playing on her four string cigar box guitar - and that great voice of hers opening up in places. It was 1976, I was 14, I was mooching around in the old Virgin Records shop in Edinburgh, and about to have an encounter with the manic blues rock of none other than AC/DC. This was nothing like the Megastores of later years of course - themselves gone the way of all flesh now. It was a single unit in a side street, albeit in the centre of town. I didn't have the funds to buy too many albums back then, so I decided to splurge something like 75p on a single of 'Whole Lotta Rosie'. I can't remember exactly why I'd alighted on it. I'd heard some of their stuff on a rock show on the local radio station, Radio Forth, mostly from Powerage I guess, which was their most recent studio album. And probably I'd been reading good things about their upcoming live album, If You Want Blood, You Got It, in Sounds. I think I may even have had a listen to 'Rosie' in one of those old booths with headphones they used to have in record stores back then. And of course it was terrific: the chanting of "Angus! Angus!" in synch with the first blasts of that guitar riff; Bon Scott's bluesy drawl of the opening lines, building up to his delightfully daft yell of "42-39-56 - You can see she's got it all! "; and then lift off, into three minutes or so of supercharged mayhem. Of course, this was the "single edit", with a couple of minutes or so lopped off the album version, but I've always had a soft spot for it regardless. It's lean, direct, no messing, and the call and response guitar section has always seemed sharper to me for being half as long as in the full version. Great stuff. In my Marcus Malone live review a while back, I mentioned Calum Ingram and his cello making an appearance for a rather nifty jam during the encores. His contribution piqued my interest enough for me to grab a copy of this, his debut album, on the way out. But if introducing a cello into a rocking blues gig seemed a simple enough notion, this is . . . well, different. If nothing else, as the keyboardist Jan Hammer once declared on one of his recordings: "There are no guitars on this album." West of Scotland-born Ingram isn't your typical blues muso, and I don't just mean the cello playing. According to his biography, he's spent 5 years studying at the New York School for Jazz and Contemporary Music, and composed award-winning music for an Off-Broadway musical. If the latter hints at a liking for drama, the impression is confirmed by the opening instrumental track here, the imaginatively titled 'Intro', which sounds like nothing so much as the theme music for a rather disturbing murder serial. Ingram adds vocals to the following 'Smile', sounding somewhere in the vein of The Cure's Robert Smith, or perhaps Mike Scott of The Waterboys in keening mode. Matters take a livelier turn with '03 - Don't Mean No Harm', where some straightforward drums, along with what I guess is Nathan Goheen's upright bass, to create a stronger sense of rhythm, underpinning Ingram's slinky, sometimes funky cello. Some nice sax adds more colour, but the sound is continues to be on the dry side. Jessie Arlen's backing vocals are another matter. She adds a soulful vibe to the spare, halting 'Chop', and the vocal harmonies on 'Going Home', which bobs along on a rhythm I'm guessing comes from Ingram plucking his cello. There's a subdued, minimalist air to all of this, echoing something like 'Raising Sand' perhaps, though shot through with youthful brio, with Arlen's voice contributing some welcome warmth. The peak moments are 'Game', and the closing 'Butterfly'. The former sets out with a driving rumble of a cello riff and one of Ingram's better vocals, before breaking off into another halting detour that eventually terminates in a stirring cello solo that calls to mind - oh, Jimmy Page maybe? 'Butterfly', meanwhile, incorporates wah-wah effects on some instrument or other - Ingram's cello, or keyboards? But most distinctively, it incorporates Ingram having an impressive go at an authentically bluesy vocal segment. He may not sound much like Percy Plant in his prime, but the phrasing as he sings 'Need your love so bad' has the kind of commitment that brings the album home with a sense of promise. On the whole it's probably all a bit bonkers, perhaps with the head ruling the heart too much - if there is such a thing as East European modern jazz then I guess this is what it might sound like. And yet there's still something going on here that seems to offer possibilities. The cello as an instrument of blues innovation? Well maybe. Let's see what Calum does next. The next step on the blues road was an indirect one, when I met my girlfriend Jill. I had been continuing to explore some new sounds via emusic.com, as well as going to the odd gig by the likes of The Black Keys and The Heavy, and paddling around in the shallow end of some of the blues-oriented rock I'd previously encountered over the years. But when Jill I first came across each other it quickly became apparent that we shared an enthusiasm for music. In early exchanges we namechecked favourite songs - 'Thunder Road' on my part, Van Morrison's 'Precious Time' on hers. Jill has more musical skills that I don't. In her schooldays she played the oboe, and when we met she was learning to play Scottish traditional music on the fiddle. Unsurprisingly then, she likes folk music, but her tastes are eclectic enough to encompass blues alongside country and Americana. She was in the habit of taking in a few Celtic Connections gigs in Glasgow each January, so we were soon off to see a Gerry Rafferty tribute at the Royal Concert Hall, as well as the likes of Foy Vance and Rock, Salt and Nails at Oran Mor. Jill is also a holiday fiend, and when we'd been going out for a year or more she was pondering possibilities for a big holiday in the summer of 2013, to celebrate completing her Masters degree. So when I mentioned that I had the notion of travelling down the Mississippi Delta, vaguely hoping to get some sense of the home of the blues, she leapt at the idea. 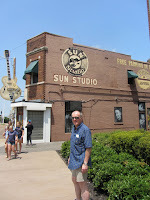 And so it was that we set about arranging a trip that was to take in Nashville, Memphis, Clarksdale and New Orleans - a journey which will be recounted in the forthcoming series, 'Adventures in the South'.